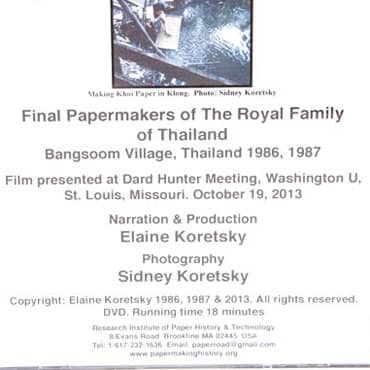 This is the latest film by Elaine and Sidney Koretsky, based on two trips to Bangoom Village, Thailand in the 1980s to locate and document papermaking in the same village that Dard Hunter had visited in 1935. At that time Hunter documented papermaking by the Niltongkum family, the only papermaking workshop in the village. In 1986 ,the Koretskys located the same village and noted that another generation of the Niltongkum family were the only papermakers still left in Bangsoom Village. They documented in detail papermaking by the two Niltongkum sisters who were children when Dard Hunter made his visit 50 years earlier. The sisters were making paper for the Royal Family of Thailand. Running time: 18 minutes. 2013.